Home Health and Hospice of Dickinson County is a non-profit organization committed to providing quality health care in your place of residence. Our services and programs, as well as relationships with patients, families, staff, colleagues, and the community, are guided by our commitment to quality service. Home Health and Hospice of Dickinson County serves patients in Dickinson County and within a radius of 20 miles from either Abilene or Herington if outside Dickinson County. 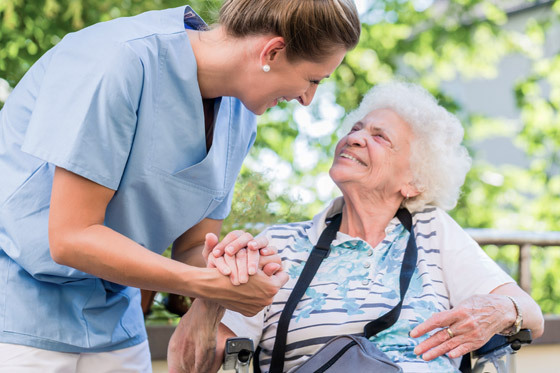 Programs participated in are Home Health Medicare and Medicaid, Private Insurance, Hospice Medicare and Medicaid, Private Pay-Home Health, State Programs, Area Agency on Aging programs and grants as available. Browse our website for more information about our services, or call our Abilene office at (785) 263-6630 or Herington at (785) 258-3611. We’re happy to answer any questions you may have. Home Health is skilled health care services offered in the comfort of your home. Our home health care professionals work with your physician to develop an individualized care program to best meet your health care needs. We strive to restore and maintain your health and assist you in becoming independent again. Our services are available to all qualified patients in Dickinson County and within a radius of 20 miles from either Abilene or Herington if outside Dickinson County. Referrals may be made by a physician, social worker, neighbor, relative, minister, the individual, or other community service agencies. A free home care assessment can be completed by request. Personalized care is tailored to the needs of the individual. Care delivered involves the individual and the family. Home health improves quality of life. What payment(s) do you accept for home health services? If you have additional questions, call Home Health and Hospice’s Abilene office at (785) 263-6630 or Herington at (785) 258-3611. Skilled nursing care is provided in the home to those who need certain health services but don’t need to be in the hospital. Our caring nurses can provide assessments, wound care, IV therapy, medication set-up, foot care, and teaching for caregivers. Licensed therapists work with home health patients if they require physical, occupational, and/or speech therapy. These services are offered in the comfort of one’s own home. Our home health aides provide services that can help the individual remain independent at home. These services may include bathing, housekeeping, laundry, shopping, errands, and nail care. Enjoy peace of mind for you and your family with emergency response help. With the Lifeline Personal Emergency Response System, you can continue living in the comfort of your own home and receive prompt, caring assistance at the touch of a button 24 hours a day. Dietary consultations are available for those needing to adjust their diet following an illness. Social services are available to patients and families if needed. Everyone wants to stay in their own home where things are comfortable and familiar. In the event of a fall or emergency, help is available at the push of a button with a personal emergency response system. The system can help you maintain your independence and reduce the worry of living alone. In an emergency, delayed medical care can jeopardize your recovery. If you are alone, you never know how long it will be before someone realizes you need help. Having access to help at the push of a button can reduce these risks. So don’t wait for a fall or medical emergency. You can have peace of mind for a little more than $1 a day. The personal help button connects you to a trained personal response associate who can send help quickly – 24 hours a day, 7 days a week. You should wear the personal emergency transmitter all of the time. It is completely waterproof, so you can even wear it in the shower. Call Home Health and Hospice of Dickinson County to have your unit installed, activated, and ready to use in minutes! There is no equipment to buy and no long-term contract to sign. The number for the Abilene office is (785) 263-6630, and the number for Herington is (785) 258-3611. Care for other conditions that cause discomfort. We consider these just as important as the patient’s physical comfort. As the patient’s condition changes, he or she may choose to place more of a focus on palliative care (comfort, but not curing). Our hospice staff and volunteers offer specialized knowledge of medical care, pain management and emotional support. Our goal is to improve the quality of our patients’ last days by offering comfort and dignity. A person is eligible for hospice care when the physician and patient have concluded that curative treatment is no longer of benefit and the physician estimates that the patient has a life expectancy of six months or less if the illness runs its expected course. Hospice care is available to all persons who meet admission criteria in Dickinson County or within a radius of 20 miles from either Abilene or Herington if outside Dickinson County. Referrals may be made by a physician, social worker, neighbor, relative, minister, the individual, or other community service agencies. A free hospice assessment can be completed by request. Hospice care is provided where the patient lives, which can mean the patient’s home, a friend or family member’s home, assisted living, or nursing home. Professional services are reimbursed whenever possible through Medicare, Medicaid, or private health insurance.Hospice also relies on memorial gifts, bequests and donations to continue providing quality services and to assist in caring for those who have no resources.Care provided by Hospice of Dickinson County is always based on need, not on ability to pay. If you have additional questions, call Home Health and Hospice’s Abilene office at (785) 263-6630 or Herington at (785) 258-3611. Our team of caring professionals has many years of combined hospice experience. Patient care is directed by your physician and followed by a hospice nurse. We use the most up-to-date methods to manage pain and other symptoms. Registered nurses monitor and provide assistance with pain and symptom management. Hospice patients have an on-call registered nurse available 24 hours a day, seven days a week (including holidays) for patients and/or family members. Our staff provides teaching for family members on how to provide care. Our home health aides can assist with bathing, personal care, light household duties, and other activities of daily living. Our licensed social worker can assist with seeking out community resources, assisting with patient and family issues dealing with loss, and provide emotional support for individuals or families. Volunteer chaplains provide spiritual support to patients and family members. Chaplains are compassionate and non-judgmental listeners. This can supplement care provided by the family’s clergy. Trained hospice volunteers are available for patient and caregiver relief. They can assist with shopping and light household duties, or allow family caregivers the opportunity to take care of necessary errands and get some time away from the house. Volunteers can also visit, read, take walks, write letters, or just sit quietly and holding a patient’s hand. Hospice of Dickinson County offers bereavement services to hospice patients’ families and the community. Below are services we offer and tools to help you through your grief. Everyone’s grief process is different. We’re here to help you through the healing process. You are not alone. Home Health and Hospice of Dickinson County offers monthly Bereavement Groups in Abilene and Herington for those coping with a loss. A loss may include the death of a loved one, a miscarriage, a home, a person’s livelihood, etc. Group members will learn about the grief process and develop skills to cope with the effects of loss. Time is allowed for sharing personal experiences. Bereavement groups are facilitated by a bereavement counselor. Persons interested are encouraged to bring a supportive partner. The sessions are free; however, a donation to cover the cost of materials would be gratefully accepted. Groups are open to the public. Pre-registration is not required. Please call (785) 263-6630 to learn when the next Bereavement Group will be offered. Our “Grief Journeys” pamphlets are educational tools for those experiencing grief after the loss of a loved one. We mail these to family members following the death of a Hospice patient, but we also make them available online to anyone who is grieving. It is best to read these pamphlets for the age and time specified. We hope these will be helpful to you. The pamphlets are available in PDF format and you may feel free to print them. Please call (785) 263-6630 if you prefer to have Grief Journeys mailed to you. Individual bereavement support is available to Hospice families for up to a year following the death of a family member. All bereavement services are facilitated by a bereavement counselor. Please call (785) 263-6630 for more information. Donations are placed in the Hospice Memorial fund. These funds are used to help the Hospice program provide patient care and quality services to our community regardless of a patient’s ability to pay. We also use these memorials for bereavement support provided for our Hospice family members and the community at large. All donations to Hospice of Dickinson County are appreciated. Your gift is tax deductible. You will receive proof of donation that will serve as your receipt for tax purposes. As required by the Internal Revenue Code, there were no goods or services provided to you in consideration for this gift. Hospice of Dickinson County is part of Memorial Health System, a 501c(3) corporation. 24-Hour call services are available to Home Health & Hospice of Dickinson County patients and family members.